Some of you know that I am going to the Blogher conference in New York City this weekend. Of all the places I have been, I have never been to New York City. Weird, huh? Not only have I turned into Ellie Mae Clampett going to the big city, but I am going on my own. No family, no friends that have known me very long. I am lucky to know some incredible bloggers from North Carolina who are going to be there. It's odd and wonderful how you can form friendships and connections with such depth in exchanges of 140 characters or less! Hershey's S'mores!! Are you kidding me? We LOVE S'mores. Working with young people has given me so many opportunities to enjoy S'mores. We have had them at bonfires, over the dying coals of the grill after dinner, small campfires, toaster ovens, even S'mores quesadillas with mini-marshmallows and chocolate chips. Our most recent S'mores adventure was before I knew about the Hershey's sponsorship. 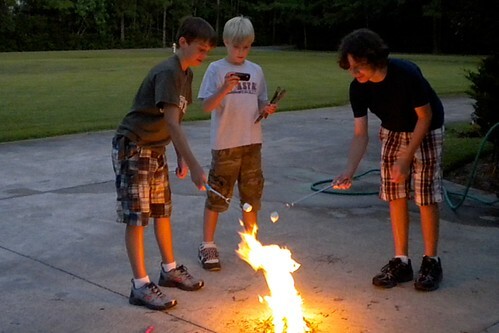 For some crazy reason, on the fourth of July, my son and some friends decided to build a small campfire. Not the crazy part. They built this fire on the driveway. (all you firefighters out there, we had hosed everything down and were safe, I promise) It was only a matter of time before they all ran inside for S'mores makings! Hershey's very generously sent us some S'mores makings and some killer toasting forks. My husband has promised the kids that they will make S'mores while I am gone and he has promised me that it won't be in the driveway. Many thanks to Hershey's for not only providing my travel on the train and the goodies, but for providing so many lifelong memories.